Hey thanks for all who entered. Congrats the winner is Jessica. You have 36 hours to claim your prize or another winner will be chosen. DrSears Family Essentials Baby Care Products have a natural scent and no harmful chemicals. 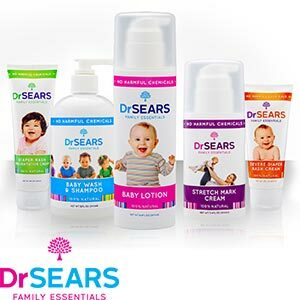 I received DrSears Stretch Mark Cream, Baby Lotion, Baby Wash & Shampoo, Healthy Baby Bottom Cream and Diaper Rash Cream. The scent is not overwhelming, which I like. Their products are 100% natural and great for a babies skin. I used the baby lotion on my hands and felt so soft. I really do like their products. Both of my boys got a bath with DrSears Family Essentials Baby Wash & Shampoo. It left their skin nice and soft. You can find their product line in Costco.com and buy it for yourself or a friend. You can visit your local Costco located here. Costco.com sells everything you need from appliances, baby & kids, computers, electronics, entertainment, funeral, furniture & decor, grocery & floral, hardware, health & beauty, home, jewerly, office products, outdoors and sports & Fitness. Check all Costco products they offer great deals in larger quantities. Start saving on everyday products.Join Costco's membership warehouse club. They offer Exectutive Membership, Business Membership and Gold Star Membership. Visit their website for more information about what membership better fits you here. DrSears Family Essentials has offered to giveaway the same 5 products I received for one of the readers. 2. Follow DrSears Dr. Family Essentials on Facebook and me on Facebook. Contest ends on December 1, 2011 at 11:59pm EST. When I will draw a winner at randomly. Please leave your email address in a comment in order to win. I will notify the winner and you will have 36 hours to respond! I'm so sorry, my daughter signed onto her gmail account and I thought I was on mine. That is my 2nd tweet for Janet W.
Subscribe using this email address.